Google keeps an eye on all apps on the Play Store. It analyzes the code of an application before publishing it on the Play Store. If the search engine giant finds anything suspicious, it will automatically pull off the app from the Play Store and warn the developer. In severe cases, it will ban the developer/application. Although the Play Store has a built-in malicious code checker, you should use a security app if you use apps from a third-party app store or a browser other than Chrome. One Antivirus app that has always been in the news for good reasons is AVG. I’m familiar with AVG and its products since the year 2006. AVG has made a tremendous progress as a security company. Its applications for desktop and mobile devices have over 300+ million users in combined. The free version of the AVG Android antivirus application has ads and several in-app purchases. You’ll see an option to upgrade/use AVG to the premium version when you run AVG for the first time on your Android device. First-time users will see a message to run the first scan in the phone’s notification panel. This notification doesn’t disappear when you swipe left. 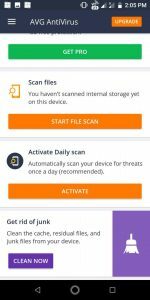 This means that AVG forces users to scan their devices. Before scanning your device, AVG Antivirus will prompt you to enable file access permission. If you don’t enable this permission, AVG will not scan some applications and files. The scanner will analyze the code of executable files the user has installed/downloaded. AVG displays its main tools on the home interface. It also flaunts an option to open the menu bar. The items in the menu bar that are marked as Pro are premium features which you can use only after upgrading the app. SMS Shield: This feature ensures that the messages containing malicious URLs are discarded automatically. Virus definitions: AVG database contains details of latest viruses, malware, etc. To make sure that your AVG installation refers to the latest database, you must update the virus definitions on regular basis. Web shield: Chrome displays warning when a user tries to open malicious or phishing URLs. If you’re not using Google Chrome, make sure you turn on the web shield function of AVG Antivirus 2019. WiFi Scanner: The Scanner requires the location access permission to work. It checks the WiFi password and whether the router/hotspot is using a security protocol or not. 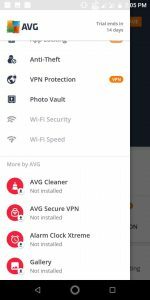 VPN: AVG VPN plans start at 460 INR/month (Around 6 USD). The annual plan costs about $17. AVG provides a whopping 76% discount to the users who opt for the annual plan. 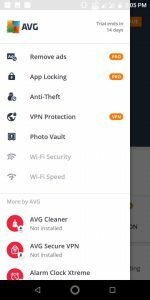 Photo Vault: AVG can prevent personal pictures from appearing in the phone gallery. To use this feature, you must set up a pin and add pictures you want to hide in the Vault section of the application. WiFi Speed: Call Blocker: Annoyed by marketing calls, open the Call Blocker utility and select the phone numbers you want AVG to block. Users can configure this app to block calls from all hidden and unknown numbers. They can also select numbers from the phone’s call log. Firewall: If your phone is rooted, give AVG Antivirus root access permission to use the AVG Firewall. This feature works only on rooted phones. Display a warning message when the phone battery is running low on power. 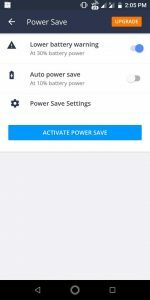 Enable power saver when the battery charge is 10% or lower. 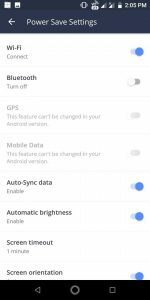 The power saver module has its own settings interface where you’ll find options give AVG the permission to control the status of various phone features. 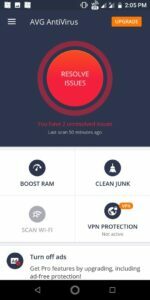 RAM Booster: If apps on your phone are not responding or are slow to respond, run the run booster tool of AVG. Junk Cleaner: Apart from finding malicious applications, AVG can also remove unwanted files from the storage memory. Anti-theft: Anti-Theft is a premium feature. 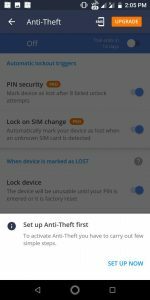 Its 14 days trial version gets activated when users tap the set-up Anti Theft option. It allows you to locate your phone on Google Map and wipe full data from a remote location. This feature of AVG Antivirus can turn your phone into a siren. It also lets users capture the photo of the thief from the AVG website. Speed test: AVG can check your WiFi connection’s upload and download speeds. 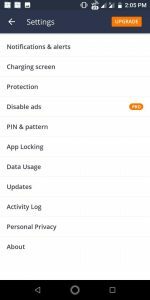 This interface of AVG Antivirus allows users to control notifications, see the activity log, manage pin and pattern, see the amount of data apps have used, etc. How did the app perform on my device? My phone has an octa-core processor and 3GB RAM. AVG took few seconds to find and scan 60+ applications. I didn’t use its RAM booster function because I don’t have the habit of keeping the apps running in the background. The vault feature is useful and so is the WiFi scanner. I have no complaints about the virus scanner because AVG has been consistently ranking in the top 5 list of AV Test’s most powerful security applications. 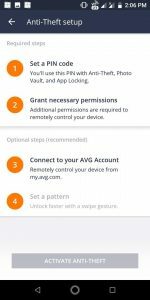 Conclusion: AVG Antivirus 2019 Premium edition is a powerful security app but its free version has limited features. If you’re looking for a feature-rich security app, you can try AVG Antivirus Premium Edition’s trial version for 14 days. If you’re searching a free antivirus app, I would advise you to try Kaspersky Mobile Antivirus. AVG mobile antivirus is a powerful security app. Its premium version is ad-free and feature-rich. The free version of AVG has plenty of ads and not meany features.